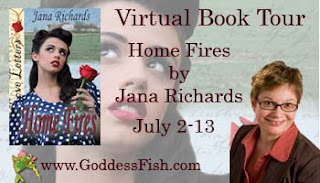 Reader Girls is the today's stop on the Book Tour for Jana Richards' historical romance novel, Home Fires presented by Goddess Fish Promotions. 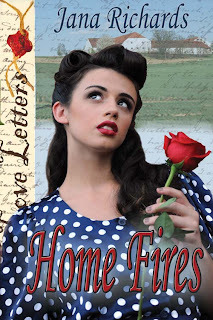 The author is sharing an excerpt from her book and has written a guest post on why she chose WWII as the setting for her story. Also, be sure to leave a comment to be entered in the author's giveaway. Blurb: Anne Wakefield travels halfway around the world for love. But when she arrives in Canada from England at the end of World War Two, she discovers the handsome Canadian pilot she’d fallen in love with has married someone else. Heartbroken, she prepares to return to London, though she has nothing left there to return to. Her former fiancé’s mother makes a suggestion: marriage to her other son. She offered him her hand. Erik looked at it for a moment, then at her face. Not a trace of pity marred her beautiful features. He took her small, soft hand in his, and was surprised at the strength with which she pulled him to his feet. He nodded. After witnessing the blood bath at Dieppe, he knew exactly what she meant. “How far is it to the house?” she asked. He pulled the offending leaves from her hair, letting his hand linger on the silky tresses. She looked up at him, her dark brown eyes huge and round. But she didn’t move or stop him from touching her. With her porcelain skin and fine bone structure, she looked like a delicate English rose, yet he detected a strength in her that would put any man to shame. “We should go,” she whispered. Erik dropped his hand. What was he doing? This beautiful English rose was still in love with his brother. His handsome, fit, unscarred brother. She didn’t want him. He’d do well to remember that. He’d already been rejected by one beautiful English girl because of his scars. Another rejection would be more than he could bear. Why did you choose the backdrop of WWII for Home Fires? When I was a kid, one of my favorite things to do was to go through a box in my mother’s drawer filled with old photos. Inside this box I found a black and white picture of two young women I didn’t recognize, dressed in old fashioned 1940s clothes. When I asked my mother who they were, she said my dad had taken the picture in Scotland during the war when he’d been training for the D-Day invasion. My dad eventually came home and married my mother, but I always wondered what happened to those young women. Did they remain in Scotland or did they find themselves swept off their feet by other dashing soldiers? “Home Fires” is the story of a war bride and can only be told against the backdrop of a global conflict. Since time began, women have fallen in love with foreign soldiers during times of war and followed them back to their countries. But the sheer number of marriages that occurred between young British woman and Canadian soldiers during World War II is truly phenomenal. Some 48,000 war brides (mostly British) along with 22,000 of their children came to Canada during and after the war. I’ve always found their stories compelling and wondered why they chose to leave families, friends, and even their country to follow their hearts. To answer that question, I had to put myself into the head of a young woman in Britain in 1939. For the second time in less than 25 years, Europe was at war. Rationing had begun and there were shortages of everything, including food, clothing, and petrol. All the eligible young men were joining the armed forces. Many were sent to far-off places like North Africa or Burma. Others served in the British Navy or the Royal Air Force. Many didn’t survive. A friend of mine who grew up in England once told me that his mother had been engaged twice during the war and both times her fiancé had been killed in action. She eventually married his father, who was several years older. Simple demographics meant that young women outnumbered young men in Britain. If she wanted to get married and have a family and a good life, a young woman might have felt the need to look beyond her country’s borders for a mate. Enter the Canadian troops. Canadians were in England from 1939 to 1945, the entire duration of the war, which gave them plenty of time to get acquainted with the local female population. They had more money and better uniforms than the British troops, and I’m sure there was a certain fascination with them because of their funny accents and different customs. Whatever the attraction, many marriages took place. Beginning in 1942 and continuing until 1948, war brides and their children were relocated to Canada. In the accounts I’ve read, written by the war brides themselves, most were terrified at the prospect of leaving their families, and many thought seriously about not getting on that ship bound for Canada. But most did. Though some courtships and marriages occurred with whirlwind speed and little knowledge of each other, both parties were committed to making their unions work. The surprising thing is not that there were failures among these marriages, but that so many of them endured. I wanted to tell the story of one of these war brides, and even though Anne Wakefield is fictional, I hope she embodies some of the courage and resilience of the real war brides. 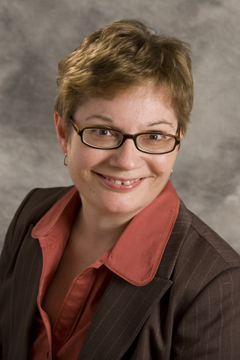 About the author: Jana Richards has tried her hand at many writing projects over the years, from magazine articles and short stories to full-length paranormal suspense and romantic comedy. She loves to create characters with a sense of humor, but also a serious side. She believes there’s nothing more interesting then peeling back the layers of a character to see what makes them tick. When not writing up a storm, working at her day job as an Office Administrator, or dealing with ever present mountains of laundry, Jana can be found on the local golf course pursuing her newest hobby. Jana will award a $25 Amazon GC to one randomly drawn commenter during the tour. Follow the tour and comment to increase your chances of winning. I love the idea behind this story. I am definitely going to read this one. Thanks Sophia Rose! I hope you enjoy "Home Fires". I love historical romance novels! It's like time travel to the past. Enjoyed this blog also. Thank you. Great analogy! I never thought of it that way before, but reading a historical romance is sort of like time travelling. Glad you enjoyed my post. You chose such a fascinating subject to write about. I love looking through old photographs. When my husband's uncle passed away, we inherited a box of old photographs from him. The box contained pictures of some people we know but many we don't. He took pictures of people in Blackpool when he was in England training during the war. Apparently they're relatives, but he didn't write down their last names so we have no idea who they are. So let that be a lesson: always label your photos! Still, we're going to hang onto those old photos. I like historicals that take place in the recent past...they still illuminate a time I don't know much about, but I can relate to the characters much more. I enjoy a little history with my fiction as well. Thanks for following. Everytime I read the story line, I am filled with emotion. What a tender, awesome love story. Thanks for saying that, MomJane. Filling a reader with emotion is exactly what I hoped to do. I'm just in awe of those women who gave up everything they knew to take a chance on love and marriage. They uprooted their lives to join men that they hardly even knew. Passion is easy to find during war time. How so many of them made it work afterwards is so inspiring! Yes, the truly inspiring thing is that the vast majority of these marriages survived for many years. These women were tough; they'd lived through war, and blitz, and rationing so they had to be. They were determined to have better lives in their new country, and they were determined that their marriages would work. And for most of them, that's exactly what happened. Great story line. We are probably seeing some pretty fabulous children of these women who risked so much for love. There are a lot of fabulous offspring! Some 22,000 were born overseas and came with their mothers to Canada. And a whole lot more were born after that! I'm a fan of historical fiction, too. I like a lot of different time periods. My tour and my contest are over now, but I'm glad that you were able to drop by and read my blog. I hope you enjoy HOME FIRES.